I obviously love to read- or I wouldn’t have created the #NASCAR Reading List feature here on BadGroove. But what you might not know is that I love books themselves. Yes, I am talking about those bound collections of paper with writings in them. I can’t tell you how much I miss bricks and mortar bookstores (the nearest one to me is in the next county- 27 miles away or so) because I would often just go to wander around and look at the books on those occasions that I didn’t have anything else to do. If I had a huge house- I would devote a whole room to being a library, but alas I don’t have a house like that so I have a book case. A very crammed full book case at that, which is one of the reasons I invested in an e-reader. I now only keep physical copies of books I absolutely love as it’s all I have room for now. Most of those books are works of fiction with a small motorsports section that is crammed so tight I have had to weed through it multiple times. I think I might fudge this one and put it in my photography section so I don’t have to weed out any more of my beloved motorsports books. As much as I love to read- I am not a huge fan of historical fiction. To me the genre is a contradiction to itself- is it history or is it fiction? In my mind- you can’t really be both since history deals with real people, places, and times. Conversely, by it’s very definition, fiction is fabrication, and of the imagination. Plus I tend to enjoy my books to be set in the here and now or that at the very least could be set in the now despite when it was written. That’s just my personal preference- what makes me me I guess. Does that mean that is ONLY what I will read? No- of course not. When I was offered a reader’s copy of Tracks: Racing The Sun by Sandro Martini, I went into it knowing that I was going to be reading historical fiction. I figured since it was about racing I would at the very least give it a try. This is another case where I am so glad I did. 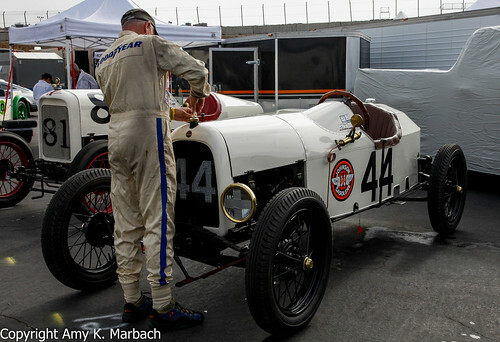 I don’t know if it was made more realistic to me because of attending the Historic Car Races out at Mazda Raceway Laguna Seca this year where I fell in love with the pre-war section of the paddock area. Or maybe it had to do with reading and reviewing the Eddie Rickenbacker biography earlier this year…but Tracks: Racing the Sun was a lovely surprise I might have normally dismissed casually because of the genre. ‘And then it kills you with a smile,‘ completed Varzi.”- pages 307-308 Tracks: Racing the Sun by Sandro Martini. I live on the Monterey Bay and last week was Car Week. Monterey Car week centers around the famed Concours d’ Elegance which if you are not familiar with Concours it is a very prestigious car show where cars are judged on a variety of merits including authenticity, function, history, and style. It’s a huge event and beautiful and amazing cars from around the country are entered. To go along with Concours there are tons of car-related events: car shows, motorsports club gatherings, tons of car auctions, car accessory and art shows, and the Rolex Motorsports Reunion. 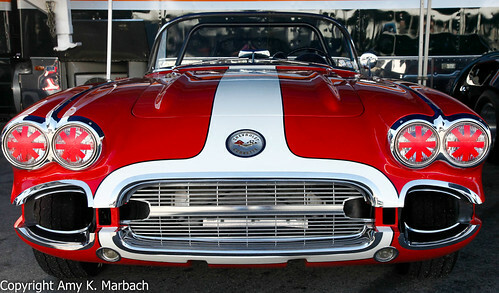 I have had a chance to wander around some of the car shows and auctions in recent years (i.e. the free ones) but I have never actually gone to the Rolex Motorsports Reunion at Mazada Raceway (Laguna Seca to us life long locals) until this year that is. My dad got his hands on free tickets for Saturday and asked if I would go with him. My answer was HECK YEAH! I love cars, I love racing, and I didn’t have anything pressing to do on Saturday that couldn’t be put off until the afternoon- so going to the raceway for free? Sign me up! We got to the raceway early on Saturday morning and it was foggy which is not uncommon for this area this time of year. The fog burned off early and we had sun for most of the day. We spent the first part of our day in the paddock enjoying all the cars on display and getting ready to race. And of course you know I took my camera with me because I love getting pictures in the paddock!